Viscous liquid latex. 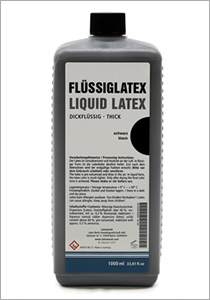 Produces latex with approximately double the thickness of the liquid but non-viscous latex. For detailed moldings or for the dipping art technique. Can be used on textiles (latex nubs on slipper socks to prevent the wearer from slipping) or on skin (make-up, bodypainting, etc.). This liquid latex has three different viscosities and seven colours that could be mixed together. You can create a new colour by mixing the basic colours together. The non-viscous liquid latex and a spredable latex paste you will find down below. The viscous liquid latex is vulcanized and gets solid when air-dried. Stabilised with a 0,3% ammonia. Please also note our further notes in the glossary.